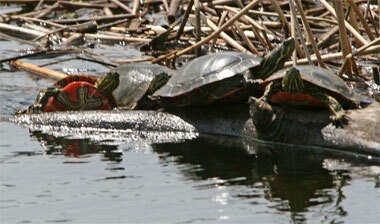 Western painted turtles - photo by Rick Leche on Flickr (noncommercial use permitted with attribution / no derivative works). Jay Baichi's two classes (2007-2008) researched Colorado reptiles and decided that the western painted turtle (a common sight around many Colorado ponds and lakes) was most representative of Colorado reptiles. The 4th graders began the process to promote the adoption of a reptile symbol for Colorado in 2007. The next year students completed the necessary legal steps and Governor Ritter signed HB 08-1017 on March 18, 2008 naming the western painted turtle as Colorado's reptile symbol.